Utah JGS would like to extend its congratulations to Marelynn Zipser who received the Volunteer of the Year award from the IAJGS at the 2016 Conference. 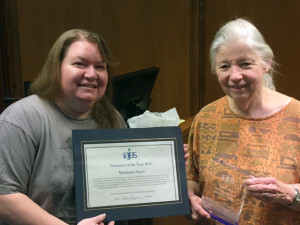 Marelynn’s award acknowledges her years of transcribing records for Hungarian SIG. The H-SIG database originally started with Marelynn’s transcriptions and she has indexed well over 150,000 records, comprising about 14% of the SIG’s database, as well as over 65,000 vital records. UJGS was happy to have nominated Marelynn for the award and we thank the IAJGS for acknowledging one of our founding members for her huge and ongoing contribution to Jewish genealogy.